Kiril Jeliazkov is a DC-based artist known for his energetic, large-scale canvases. Jeliazkov was born in Yambol, Bulgaria. Having graduated from a fine arts high school he then attended the Fine Art Academy in Soﬁa, Bulgaria, and in 1999 enrolled in the Savannah College of Art and Design with a full Presidential Scholarship. With this renowned American arts institution as his base, Jeliazkov continued to develop as a ﬁne art artist, traveling frequently for inspiration and painting the wide variety of people and cultures he encountered. In 2001, Kiril spent two and a half months in Kenya where he worked on canvasses that captured the colors and patterns of life in Kenya. His continuing travels took Jeliazkov to Turkey, Italy, Spain, and Brazil. Upon his return to the US, the resulting exhibitions were notable for their cultural and artistic dynamism, coupling the vibrancy of each place with Jeliazkov’s energetic style. Jeliazkov has participated in many exhibitions in Europe and the Americas. He has won numerous prizes and awards. In 2002 he was granted a residency in New York City where he spent several months painting and working with other leading artists. In March of 2003 Jeliazkov was honored to be included in an exhibition of 50 artists from 50 different countries at the Headquarters of the United Nations in Manhattan. In 2006 Jeliazkov mounted his first large scale project, The Orange Step. 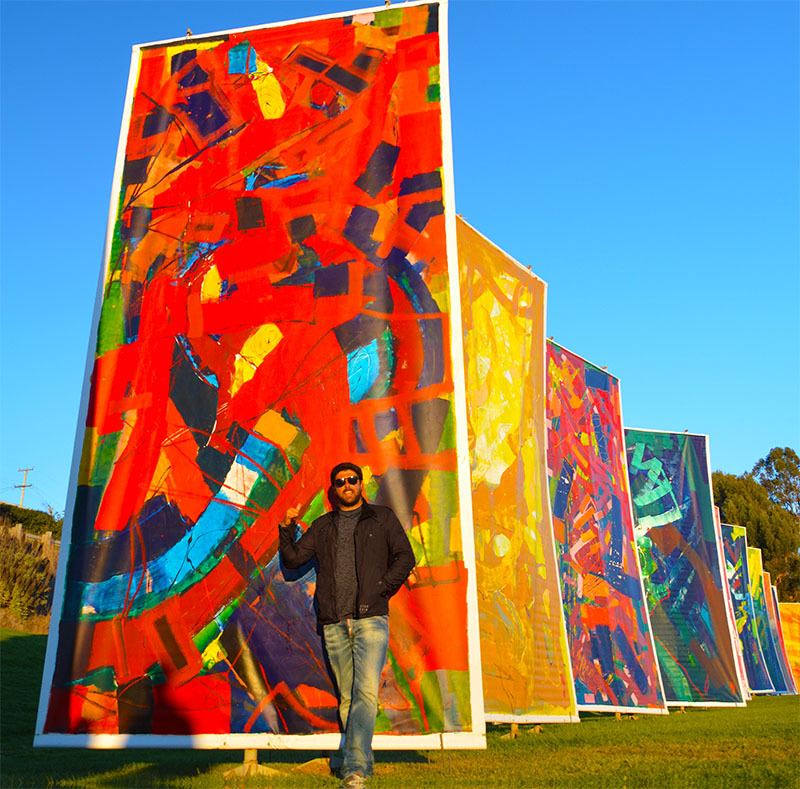 The project was composed of 128 canvases—each 22 feet high by 11 feet wide. The project was inspired by the idea that Art should be for everyone, hence the monumental nature of the canvases themselves and their exhibition in expansive outdoor spaces. The Orange Step was first displayed in September 2006, at a national park in the Bulgarian city of Yambol. The exhibition was mounted a second time in Savannah’s Forsyth Park. The Orange Step was displayed a third time in Palm Beach, FL, at the PGA Honda Classic in 2008, and again in 2013 in Tiburon, CA, in view of San Francisco’s iconic Golden Gate Bridge. Jeliazkov completed his BFA and MFA in painting at SCAD in 2007 and has made Washington, DC, his home for the past five years. When not traveling for inspiration, he paints at the Toolbox studio and curates the gallery space there with a combination of his own works and that of other rising artists. © 2019 Toolbox Art Gallery .